Tibet's exiled spiritual leader the Dalai Lama has repeated his wish to visit China, on the anniversary of the 1959 uprising against China's takeover. The Dalai Lama has made several such calls before, but China has always refused, accusing him of separatism. 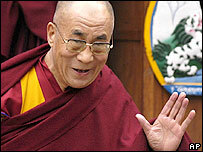 The Dalai Lama said he wanted to see for himself China's development and visit Buddhist pilgrimage sites. In a speech to mark the anniversary, he also stressed his desire for Tibetan autonomy, not independence. Representatives of the Dalai Lama and the Chinese government met last month for a fifth round of talks, in an ongoing dialogue. "As well as visiting the pilgrim sites, I hope to be able to see for myself the changes and developments in the People's Republic of China," the Dalai Lama told thousands of followers in Dharamsala, northern India - the seat of the exiled Tibetan government. He also said that the last round of talks between the Chinese and Tibetan delegations should have cleared any doubt as to his aspirations for a future Tibet. "I have stated time and again that I do not wish to seek Tibet's separation from China, but that I will seek its future within the framework of the Chinese constitution," he said. "Anyone who has heard this statement would realise, unless his or her view of reality is clouded by suspicion, that my demand for genuine self-rule does not amount to a demand for separation." Correspondents say there have been no tangible results so far from the talks, which resumed in 2002. But Lodi Gyaltsen Gyari, the Dalai Lama's chief representative, said after the February talks that there was a growing understanding between both sides.